cubeSQL is a fully featured and high performance relational database management system built on top of the sqlite database engine. We developed the first commercial grade DBMS based on sqlite back in 2005 and over the years we continued to improve our server to better suit all our customer's needs. cubeSQL is the final result of all our efforts. cubeSQL is incredibly fast, has a small footprint, is highly reliable and runs on Windows, Mac and Linux (32 bit and 64 bit for all platforms). cubeSQL can be accessed with PHP, JSON, Xojo and with the native C SDK. cubeSQL is written in low level ANSI C so it can be easily ported to any operating systems. cubeSQL is based on SQLite, the most popular embedded database engine used by Google, Mozilla, Adobe, DropBox, Apple and many others. In order to share your single user sqlite database file with thousands of clients, just drag the sqlite database file into the server's databases folder. That's all! Because it is based on SQLite, cubeSQL is both highly reliable and fast. You can easily turn any single user database application into a multi-user application. The cubeSQL Admin application has an easy to use and intuitive interface with far more functionality than ever before. Schedule and restore backups, examine performance statistics, and more. cubeSQL supports all SQLite extensions allowing you to take advantage of all kinds of new functionality that others have added to SQLite, the database engine of cubeSQL. cubeSQL uses state of the art technology to maximize performance. Thanks to its powerful architecture cubeSQL is able to work on all operations at the same time preventing large and time-consuming operations from slowing down other users. cubeSQL successfully solved the C10K problem years ago. In the unlikely event of a disaster, your database will only be as good as your last backup. But what about the operations that happened AFTER the backup? No worries. With Restore Points, cubeSQL can now log every operation and allowing you to restore your database right up to a specific operation of your choosing. AES, also known as Rijndael, is a block cipher adopted as an encryption standard by the U.S. government. It has been analyzed extensively and is now used worldwide. cubeSQL supports AES encryption for writing data to the database and in all the network communication between the server and all the connected clients. Database servers tend to store data as a large collection of files and often these files are in a location that only the database engine itself can access. This makes the data harder to access and manage. Some SQL database engines provide the option of writing directly to disk and bypassing the filesystem all together. This provides considerable setup and maintenance complexity. cubeSQL keeps things simple, a database is a single ordinary disk file that can be located anywhere in the directory hierarchy. 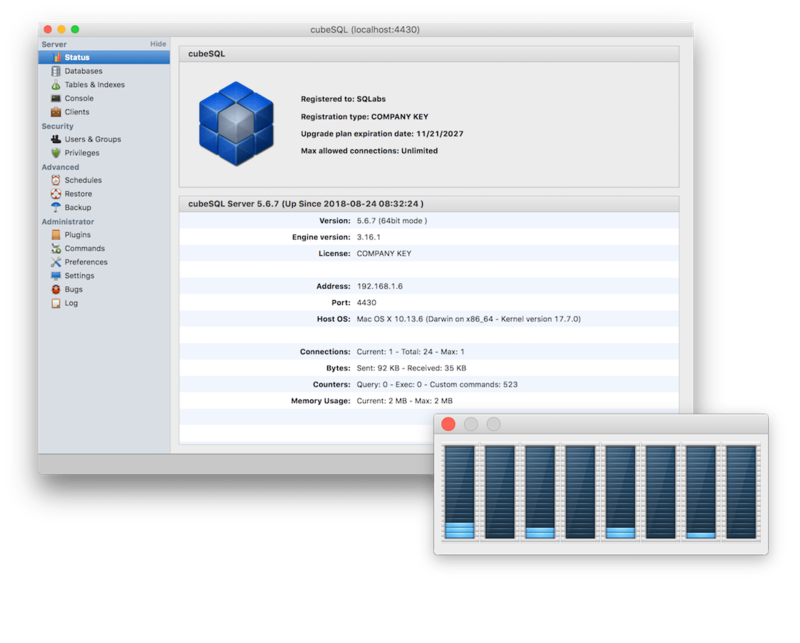 cubeSQL is available for Mac OS X (x86 and PowerPC), Windows and Linux (x86). All the databases created by the server are cross-platform. A database file written on one machine can be copied to and used on a different machine with a different architecture; big-endian or little-endian, 32-bit or 64-bit does not matter. All machines use the same file format. Furthermore, we have pledged to keep the file format stable and backwards compatible, so new releases of cubeSQL can read and write older database files. cubeSQL is fully ACID compliant. ACID stands for atomic, consistent, isolated, and durable and it deals with reliability of database transactions. This is important because it means that you don't have to worry about users accessing the database in an unfinished state. Users can't see changes that are being made but have not been committed. If the server loses power or crashes in the middle of a transaction, the server is restored to its untouched state automatically. ACID compliance is critical to any database you depend on. cubeSQL supports full-text searching making it possible to build a new class of database applications not possible with previous versions. You can now store huge amount of text-based data and search through it in seconds. cubeSQL supports a custom lightweight protocol but in order to be as open as possible to third party clients, we added support for the widely used JSON protocol, so you can access the server using any client that supports JSON. cubeSQL automatically compresses all data between the server and the client to greatly improve response time. Large queries can also be subdivided in configurable chunks in order to increase responsiveness. cubeSQL can handle up to 10,000 concurrent connections from a single server installation! No need to install multiple servers and configure them for concurrency and load balancing. cubeSQL remains as simple to install and as easy to manage as ever while providing extraordinary scalability. Finally, cubeSQL is fully multi-core aware so it will take advantage of all the computing power you give it. cubeSQL has a modular plug-in architecture and you can use it to extend the SQL language, change how your results are sorted or even create your own custom server commands. The plug-in architecture gives you the ability to enhance the power of cubeSQL in ways limited only by your imagination. A native plug-in SDK is included within each server's installation. MonkeyBread Software offers some useful plugins. Database triggers enable DBSA's (Database Administrators) to create additional relationships between separate tables. For example, the modification of a record in one table could trigger the modification of a record in a second table. cubeSQL supports the creation of triggers that can execute when rows are inserted, updated or deleted on a table by table basis.